NEW LED hand spinner arrival. Great for Fidgeters, Anxiety, ADHD, relieving stress, Autism, quitting nail biting and smoking, and concentration. High quality bearing allows for smooth, quiet, and fast spins. Hold Spinner in one hand and use your other hand to continuously spin it quickly, practice using only one hand and doing tricks by moving spinning fidget from one hand to another. Take each LED light out and turn them clockwise to turn on. Turn them the opposite direction to turn off. They are held in place with magnets.If you have any questions about your spinner, please contact us. Thank you! 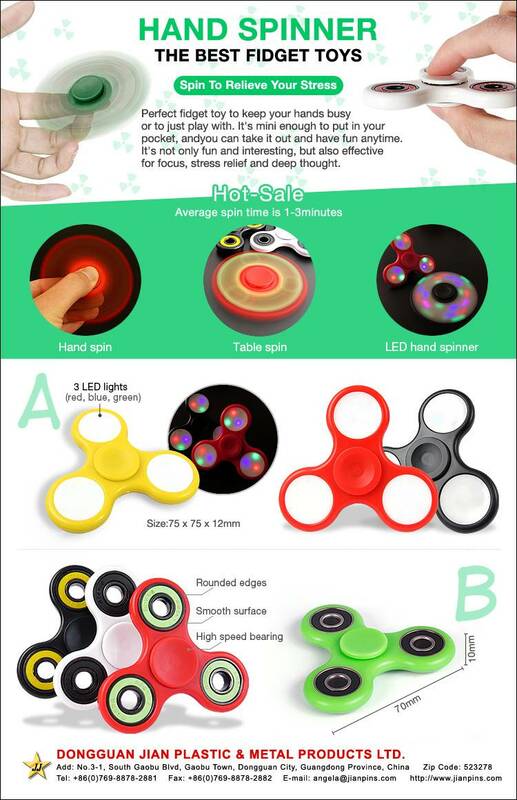 LED hand spinner is really popular all over the world right now, you won’t want to miss this trend to occupy this big market earlier. Come one and spin your brand. Our package for those hand LED spinner is shown below for your reference. Size is about 90x90x11mm. The front and back side printing of the box are as follows.